Yesterday, I stopped by Trader Joe’s to pick up a few necessities for upcoming meals—almond milk, tortillas, and such. (Because of the recent polar vortex, they were out of everything I needed. Astute Chicagoans, understanding that they might be surrounded by brutal wind chills and frozen snow drifts for forty-eight hours, apparently bought groceries to last three weeks). I’m not one to walk into a grocery store—especially Trader Joe’s—and not buy anything. So I picked up a few unfamiliar-to-me items. 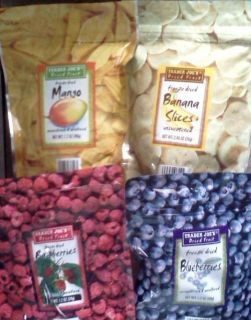 And this, dear reader, is how I came upon a small, unassuming bag of “freeze-dried” mangos. For those of you who are familiar with the product, please excuse my ignorance. I admit to having scanned the package on previous shopping trips and passing it by. 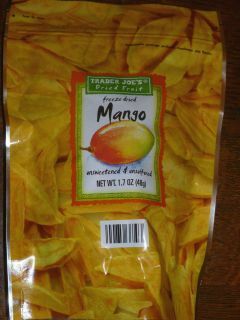 The package itself is misleading—merely showing wrinkly, dried mangos, not freeze-dried mangos. And there is, my friends, quite a difference. I skipped the purchase of it so many times before because I wasn’t in the mood for tough fruit. In the same manner one must be ready for tough love to truly enjoy it, if one eats tough fruit when one isn’t in the right mindset, it feels more like punishment or manipulation. So I passed. But yesterday was ripe for change. Maybe it was all of those empty shelves. Maybe I was a little high off of those numbing eye drops from the opthamologist. Whatever it was, I am grateful. And perhaps, a little doomed. 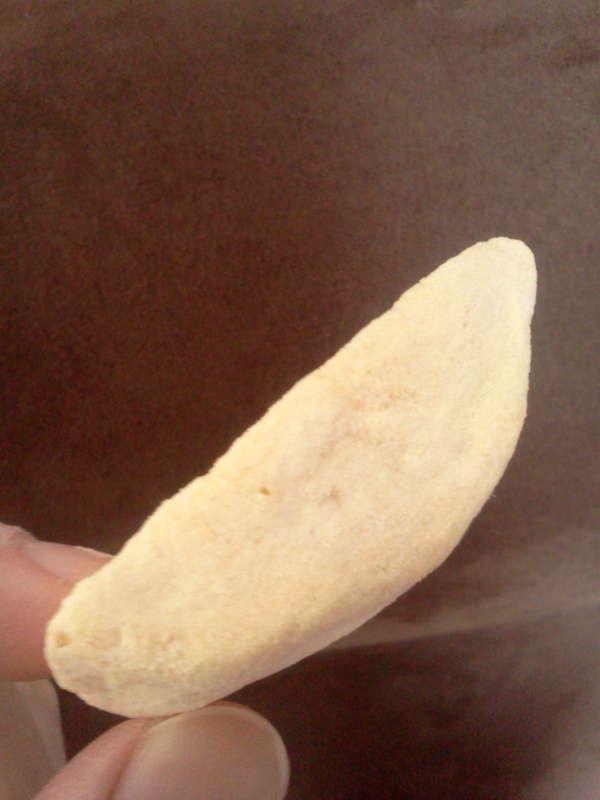 Imagine angels’ voices singing, for that is the only caption worthy of this lone piece of mango. These mangos have not been dried by the cruel sun, which would give them the appearance of a suburban mom who has tried to burn up all of her repressed feelings at the tanning salon. No, these mangos have been dried up in the heavens by the tiny breath of little cloud sprites, filled with magic and love. And why add morbidity when you don’t need it? Everything, the taste, the texture… is perfect as it is. And yet, after eating just two delightful pieces, I fell victim to the downside of these morsels. Oh my god. There are more. Mangos are sweet because they have sugar; naturally found sugar, of course. But sugar, nonetheless. And the sugar is mostly what is left after the fruit has been freeze-dried. These light, yet sugar-dense treats have so little substance, that they cling to the first substance they find—your teeth—and do not let go. Swishing, picking, and brushing were all unsuccessful at getting every last bit of the packed-in sugariness removed. I am so very fortunate that I did not find these treats when I was in my invincible twenties. I wouldn’t have had the caution or the realistic fear of major dental work to contain my urges to eat bag after bag of the magical sugary goodness brought down to us from the sky elves. Thank those love-filled heavens that I didn’t open any of these packages until my late thirties, when invincibility is far away and not even a mid-life crisis could sway me to risk it all and not practice restraint with these innocent looking sugar demons. I would definitely recommend trying as much of this treat as you think you should, depending on your age and how long you must wait until your next visit to the dentist. I just found these yesterday after having tried the freeze dried banana (a gateway fruit). They are indescribable, although you have done a wonderful job. They are my newest TJ’s addiction.